This article was originally published in the Sept. 18, 2016 edition of the Sun. Purchase a Worcester Sun membership for as low as $2, or sign up for our email newsletter below. Freshman year of high school, my older sister slipped me a note in the hallway before my first day on the rowing team. The note outlined what to expect, what not to do, and even a few words of encouragement. One tip I’ll always remember was to carry an extra pair of socks in your backpack. They can easily get soaked on the docks. Wet socks or not, I know I’m one of the lucky ones — someone who has discovered the sport and community of crew. 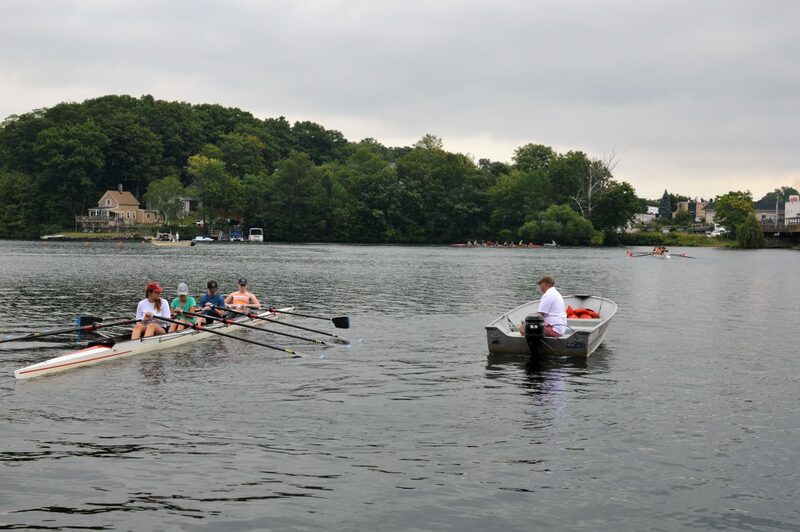 Now, Worcester-area kids as young as middle-school age have an opportunity to get on the water and try their hands at the sport, thanks to Lake Quinsigamond Community Rowing (LQCR). I sat down with “Woo Crew” head Coach Richard Stavros — the district-wide team is officially called Worcester Public High School Crew — to discuss exciting recent changes in LQCR’s offerings to area young people. The “Junior” program, which is for high schoolers, is being expanded to more schools in the area. Meanwhile the organization is making a separate push to get more city middle schoolers introduced to crew, offering programs for the fall and spring rowing seasons. Stavros is an alumnus of St. John’s High School in Shrewsbury, where he rowed for four years in the 1960s. After graduation he coached the Worcester State College rowing program from 1971 to 1980, and has been head coach of Worcester Crew for almost 20 years now. 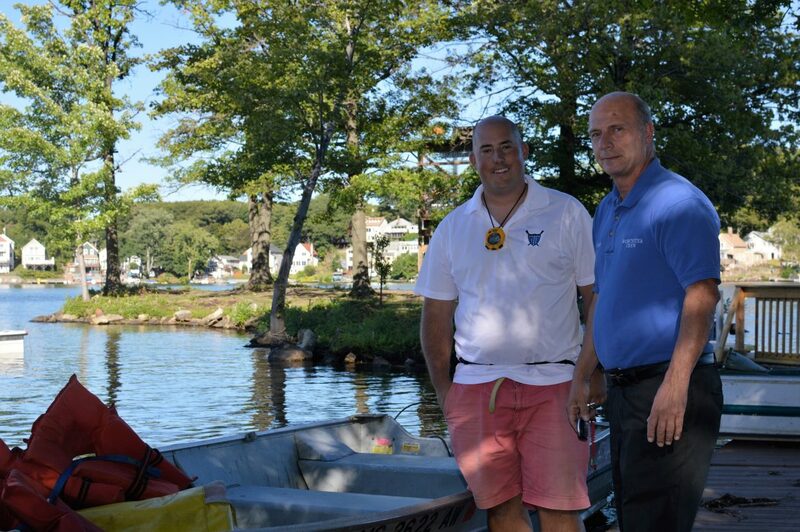 Stavros has overseen the involvement of the team in the New England Junior & High School Regional Championship Regatta in the fall as well as the state championships in the spring, which are open to all public and private clubs and teams. In other words, he’s your go-to for all things related to local rowing and the lake. “This is a lifetime sport that I’m very passionate about, and I want to share it with others” Stavros said. His assistant, coach Nick Wright, from Boston, will be working with both the middle school and junior rowers, but he is by no means new to helping start a rowing program. In 2009, he and a friend started Arlington–Belmont Crew along with Stavros. He rowed through middle school and for Maritime Rowing Club in Norwalk, Conn., and at Trinity College in Hartford, winning the national titles his freshman and senior year. Nick Wright, left, and Richard Stavros are expanding the opportunity for students to learn crew at Lake Quinsigamond Community Rowing. Wright is also not new to LQCR. He has been coaching its summer program in Worcester for the last six years. That program, which runs from late May to early July, is open to anyone of high school age. 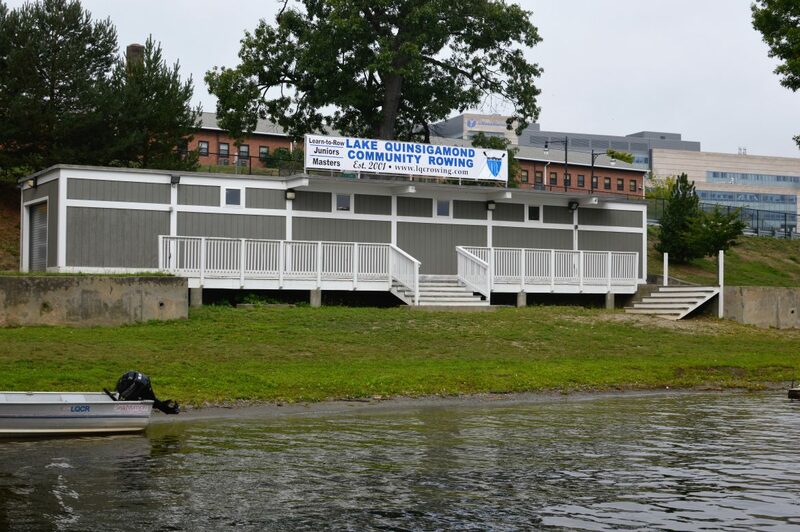 The new Junior program will be an extension of this summer program, letting kids in nearby towns like Auburn and Holden whose high schools were not previously connected to Worcester Crew row during fall and spring in addition to summer. 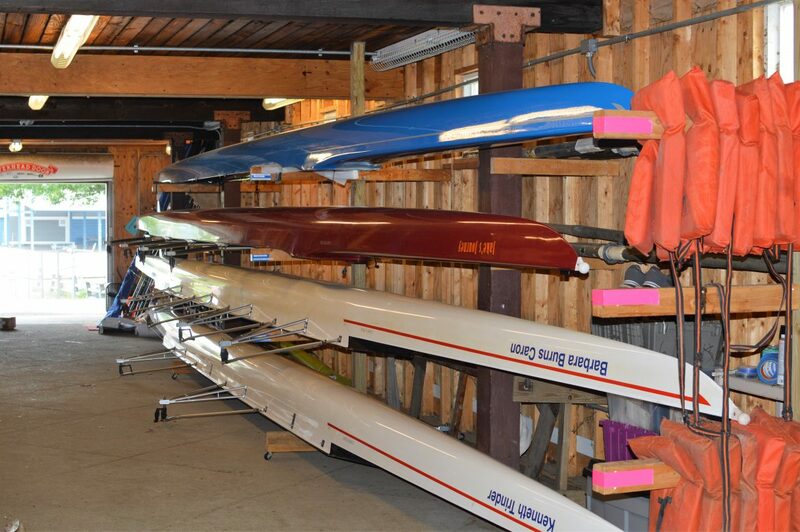 Stavros said he hopes the Juniors program will grow to rival Community Rowing Inc. (CRI) of Boston, the nearest program to Worcester that welcomes high school-age rowers. Wright spoke about the middle school program, emphasizing getting to kids earlier as a feeder program into high school rowing. His own middle school experience mirrors that of the plan for the Worcester middle school program: a noncompetitive program that gets kids on the water, helping them to become comfortable in a boat and develop into athletes, making sure they have fun along the way. His main goal is to get kids to learn and become familiar with sweeping — rowing with one oar — and sculling, which means rowing with two oars. Wright himself never saw a race until his freshman year in high school. “That’s a moment — after so much preparation — that I’ll never forget,” he said. Later, he went on to row with the likes of Olympic rowers Charlie Cole, Andrew Campbell and Peter Graves. Coach Nick Wright, in launch, directs participants in LQCR’s recent summer program. The goal with the middle school program is to not have any pressure to perform, but instead cultivate a love of the sport. The Junior program operates from the same idea. To Wright, learning to love the sport and learning to “go fast” are two of his priorities. It’s an intense sport, but Wright says crew proves to be an outlet for kids, especially high school students. He emphasizes that the Junior program is about community, forming bonds with other people, and growing as a student, rower and person. “This is a sport that me and Stavros love. We want to share that passion for the sport with others,” Wright said. He hopes for the two new expansion efforts to eventually attract 25 or 30 new participants, starting out as novice and working their way from there. The fall programs have already launched, but novice rowing will be offered again in the spring for any students interested. The fall Juniors program is running from 3:30 to 5:30 p.m. Mondays through Fridays in the upper boathouse alongside Worcester Crew. Stavros and Wright are trying to keep it affordable. The Juniors program costs $450 per season, as opposed to CRI’s comparable program, which is $1,200 per season. Junior rowers have three seasons: spring, summer and fall. There are two seasons in the school year for middle schoolers, spring and fall. Middle schoolers row on Fridays and Saturdays for $200 per season. Organizers saw a need to expand offerings to high school-aged rowers in the area, and also to develop interest in rowing among pupils from middle schools, in order to eventually get students at more local high schools — public, private and charter — involved in crew. Charter school high schoolers in this area, for instance, have not previously had rowing as an athletic option. Beyond that, though, organizers hope to develop a love of the sport in young rowers, a sport that can last them a lifetime. 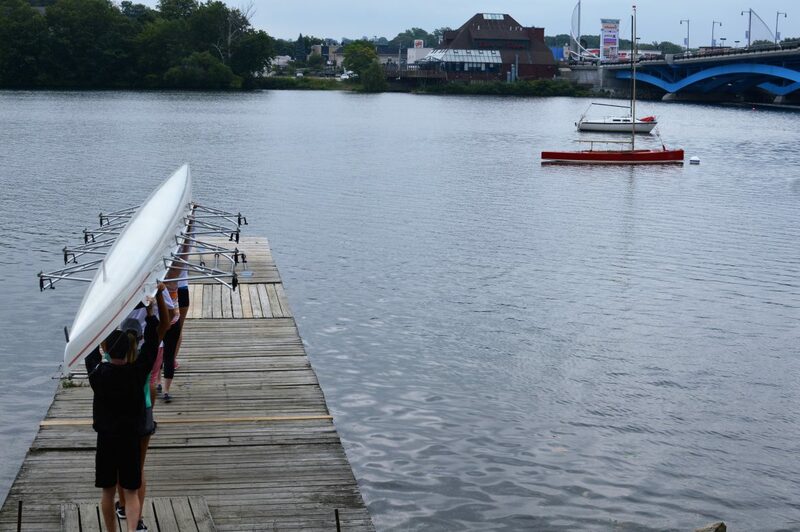 Worcester-area middle school students can now try their hands at crew thanks to Lake Quinsigamond Community Rowing. Stavros told a story about a freshman in high school who loved soccer and grew up playing it. His mom forced him into the rowing program. Stavros said that he pulled the kid aside and told him that in two weeks, if the kid didn’t like it, Stavros would tell the mother that he was unable to include the kid, and he could return to soccer. After the two weeks, the kid asked for another week to make his decision. Well, he chose to stick with the sport and is now rowing in college. He inadvertently found his passion, and Stavros knows there are other kids in the same boat — playing another sport for years and never having tried crew. As much time as the coach has spent up and down Lake Quinsigamond, rowing has also taken him to the other side of the world. Stavros was whitewater rafting in Uganda a few years ago, and noticed the prime conditions of the water. “I said, ‘This is where they should run regattas. There’s no wind they have to worry about,’ and I joked about it, and I came back and I noticed the Uganda program had qualified for junior worlds,” he recalled. He since has become involved with the Ugandan team, such as by running regattas and helping them obtain boats. One thing he found interesting from his visits to Africa? “[The Ugandans] live on Lake Victoria, which is one of the largest lakes in the world, and even the fishermen don’t know how to swim,” he said with a laugh. From the point of view of rowers, Lake Quinsigamond holds its own. It’s a busy place, and rightfully so, as it is rated as one of the best natural waterways for rowing in the world, as reported by www.mass.gov. It’s straight, there are no low bridges in the way, and the lanes are relatively equal in the intensity of the water current all along the lake. 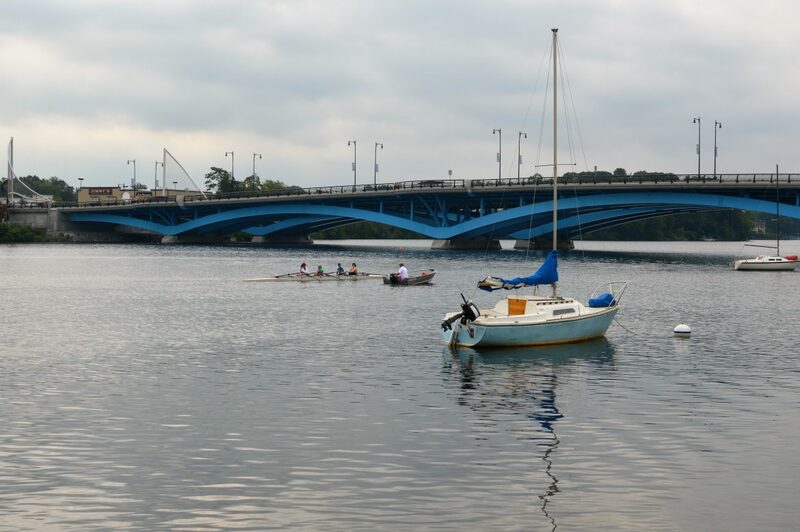 For drivers and pedestrians near Lake Quinsigamond, the boats dotting the lake are rowed in a perfect synchrony and beauty that has never been rivaled by another sport. Some are manned by crew teams from Assumption College, Clark University, Quinsigamond Community College and WPI. Others could be carrying Worcester Public High School Crew members like myself, out for an afternoon’s practice. This fall, and again this spring, it might be middle schoolers and other first-timers making some of those narrow boats glide with silent grace along the lake. In my own experience, rowing is the best kept secret in Worcester. Most rowers hear about the organization through word of mouth, or follow in the footsteps of older siblings or friends who did the program. For almost four years now, I devoted my life to one of the most challenging sports, growing stronger both physically and mentally. I’ve become close friends with the girls on my team, girls that I would have never have met otherwise, and certainly would not have been so strongly bonded with had it not been for constant hours at practice, hard workouts, or leaving the state for an all-day regatta. This is not at all uncommon in the sport. The friendships in Stavros’ experience are bonds that last 40 or 50 years, with Worcester being the perfect example of meeting kids from the different high schools throughout the district that he would have never met otherwise. Rowing is unique because it’s a truly team sport. “You either row together or not at all. You’re only as strong as your weakest rower,” he said. And yes, as consuming as this sport is, I find time for homework and anything else during the season. Crew is a demanding sport, but I make sure to keep a balance in all areas of my life, a skill I will never forget. This is a unique sport that I could write about for hours, and I’m excited the LQCR is expanding its reach to welcome more kids to it. If anyone is considering coming down to the lake to try it out, consider this your own handwritten letter slipped to you in the hallway. I’m the only one on my team who has brought an extra pair of socks with me every day for the past four years, and thanks to my sister, my feet are always dry. Maria Reidy, Worcester Sun’s first intern, is a senior at Doherty Memorial High School. She is captain of the girls varsity crew team, a National Honor Society student, an aspiring writer, and by her account a really bad driver. The Wide Woo of Sports: To the point with Worcester Fencing Club -- en garde!